ACTOR TIM O'CONNOR DIES AT THE AGE OF 90! As The Hollywood Reporter reported in accordance with local media from Nevada City, California, actor Tim O'Connor died on April 5, 2018, at the age of 90. O'Connor performed three times as Lt. Roy Devitt in The Streets of San Francisco, and for another appearance in the final season as a mobster boss. Nonetheless, he was best known for his rôle as Elliott Carson in the 1960's long-running TV series Peyton Place, performing as father of young Mia Farow and husband of Dorothy Malone. Tim O'Connor was among the busiest actors from the late 1950's throughout the mid-1980's, but he did not quit until 2011. HAPPY NEW YEAR 2018 & UPDATES AHEAD! I hope you've had a great Christmas Season and would like to wish you and your beloved ones a Happy New Year and all the best for 2018! Simultaneously, I need to apologise for the long delay in updating this website. I have been too busy in pre-XMAS weeks, but there's light at the end of the tunnel. Starting this month, I will return to a more frequent update schedule, so please stay tuned and come back very soon. Next episode is due and I will also add new location photography. I have supplemented the locations page by some location photography for second season's episode The Hard Breed, an episode that was almost entirely filmed at and around famous Cow Palace, plus some additional (mostly interior) filming locations. Still, I am working on more contents for the filming locations page, including season one episode A Trout in the Milk as well as season two's Inferno, and season three episode Letters from the Grave. 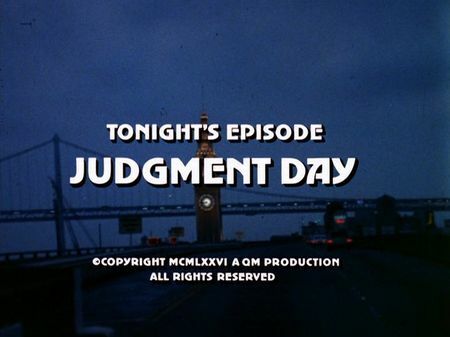 The screencaps for Judgment Day were just added to the episodes' page. The murder of Judge Lela Matthews is the latest in a row of four among attorneys and judges. Matthews' daughter, Ellen, is a friend of Steve, and just in town in order to celebrate her final exam with her mother. Investigations concentrate on finding a connection between the murdered jurists, and natural assumption suggests a convicted criminal. However, when Steve finds out that the perpetrator left a book about 'disbarment procedures' at each crime scene, a different suspicion comes to the fore. With the help of the law school's records, Mike and Steve can find the connecting link, leading to a former attorney, Elliott Jensen, who has been disbarred several years ago. When they are visiting Jensen for a questioning, however, they only find a boozer lying on a bed, living in a run-down apartment house - but with senses on the alert. It turns out that Jensen's son, Barry, is obviously on a trail of murder, killing the ones he thinks are responsible for his father's fate. Still, with one more judge on Jensen's list, our two cops set a trap with Mike performing - rather awkwardly - as Judge Abrams. Their plan fails, however, when Jensen forces them to leave the court due to an alleged bomb threat. In the following shooting, Steve is wounded, and Jensen escapes. When further investigations prove that Barry Jensen is working on the law school's library, the circle closes. Police invades the law school in order to detain Jensen - but his fate is rather lethal. 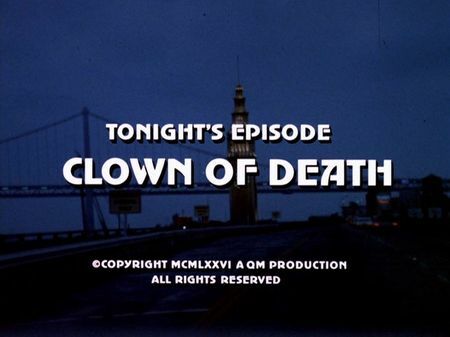 This episode starts out at San Francisco City Hall where Jensen threatens Judge Matthews and finally kills her. Mike and Steve see and talk to SFPD's consulting psychiatrist Lenny Murchison at the San Francisco General Hospital (exterior stock shot with unknown interior canteen sequence), whereas Jensen kills attorney Jerome Black at his office in the Pacific Heights, and the registry our two cops are consulting is actually located inside the Asian Art Museum at Civic Center. The boarding house where Jensen's father is living in is located in Hayes Valley (already used in Harem). The 'Rutledge University - School of Law' scenes were filmed at the San Francisco State University campus - apart from a single exterior shot (again, stock material) of what is supposed to be the library of Rutledge University where Jensen is working, which actually is Bridges Hall of Music in Claremont, down in southern California. Interior shots of that same sequence are showing SFSU again, and so does the subsequent exterior filming when Jensen tries to escape Mike and Steve. Steve is shot inside the San Francisco City Hall's entrance hall, and treated at the California Pacific Medical Center's Davies Campus.